Though becoming increasingly difficult to find, if you are willing to do a bit of hunting, the TAG Heuer Aquaracer 500m Men’s Watch WAJ1112.BA0870 could prove your efforts worthwhile. The all-brushed stainless steel bracelet and case, black-molded rubber on steel bezel, and fluted screw-down crown are just a few of its finer features. Made to accompany activities like scuba and skin diving, this time teller travels far and wide…and deep! The Men’s WAJ1112.BA08070 Aquaracer is primarily defined by it vertical blue guilloche dial, which makes it symbolic of the water sports it’s meant to aid; it is this feature that draws the most attention at first glance. But upon closer examination, one discovers the handsome silver-toned, luminiscent hands and dial markers; index hour indicators; and deployment clasp with double-locking fold over diving extension system and safety push buttons, all of which make for a highly advantageous unit. Additionally, its oranged-trimmed second hand, hand-applied TAG Heuer logo below the 12 o’clock position, unidirectional blue PVD bezel, and masculine heft all contribute to its comely air. Solidly crafted, this Aquaracer 500m carries with it the TAG Heuer name, which means its owners rank among the Olympic Games affiliates and Formula 1 Racers wearing the same logo. With a TAG Heuer watch comes a medal for form and function. 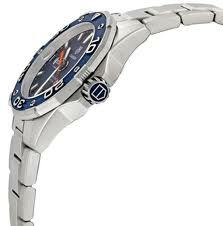 Though the ever-popular Amazon.com lists the TAG Heuer Aquaracer 500m Men’s Watch WAJ1112.BA0870, it is not currently carrying it. 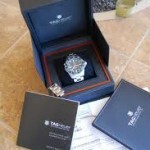 It is, however, available from Watchesonnet.com ($1,725) and Thewatchhub.com ($1,462). But the best online shopping price comes from Watchesnonstop.com where it can be found for a mere $239! Given its retail listing rings in at $2,300, any of these sellers’ offers are worth looking into. The pros of this potential purchase are clear: excellent manufacturer, raving consumer reviews, capital design, hyper functionality. The major con is its limited availability. 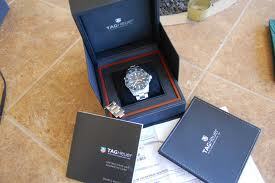 Nonetheless, the TAG Heuer Aquaracer 500m Men’s Watch WAJ1112.BA0870 can be found. And when you find it, strap that fine blue specimen round your wrist and head to the open waters…or just take a timed walk. No matter the activity, your new Aquaracer will keep cool time. 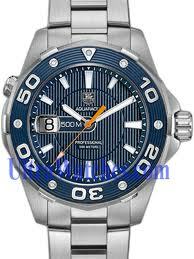 I am planing to own one aquaracer-500M(AUTO). But i would like to know the movement accuracy before purchase. Kindly provide your feedback comment on the movement accuracy. Thanks. I own many watches so I don’t wear my Tag Aquaracer WAK2120 every day. I probably wore it 90 days since I bought it. In addition, I am 75 years old so my watches don’t get much stress or abuse. In a little over a year, it broke. I took it for repair December 1st. It is now January 25th and I still do’t have it back!!!! I started to buy my wife a Tag for Christmas but I’m glad I didn’t. Such poor reliability and poor service is unacceptable. You get better reliability with a $100 watch.